What is the difference between claiming and airdrops? Airdrops were available for everyone that had at least 1.0 BTX in a registered Bitcore address. The airdrops happened every Monday until April 30th, which was the last one. The snapshot was taken between 0:00 am and 24:00 Berlin time. You had to be sure that your funds were in your registered address during that time frame. An announcement was made in the bitcointalk forum as well as on Twitter each Monday when the airdrops had been sent out. Claiming refers to our hybrid fork, that allows everyone that held at least 0.01 Bitcoin at the time of the snapshot (BTC block #492820) to claim his BTX. This is still open for anyone. In order to allow a widespread adoption of Bitcore, we opted for the hybrid-fork model, allowing all BTC holders at the time of the snapshot at the 2nd of November 2017 to receive BTX proportional to their BTC holdings at that time. If you held BTC at block #492820 of the Bitcoin blockchain and can access your private keys, you automatically received 0.5 BTX per 1.0 BTC in the same address on the Bitcore blockchain. Can I get FREE Bitcore? If you had Bitcoin on the 2nd of November 2017 AND owned the private keys, you already have FREE Bitcore. You can just claim them. There is no time limit on the claiming period; This lasts forever! During the Airdrop phase, if you already bought or claimed your Bitcore and you owned a minimum of 1 BTX, you could register for the Airdrop to get FREE Bitcore. There are also some faucets out there but they are not run by the Bitcore team. How do I safely backup my wallet and my private keys? Was there a first claiming phase before 2nd of November 2017? Yes, Bitcore started in April 2017 with an empty chain and a snapshot of the Bitcoin blockchain @ block 463619. Claiming your BTX 1:1 BTC was possible via a signed message service on the website bitcore.cc until 1st of November 2017. After that, the remaining unclaimed balances were redistributed: 50% are available via the new snapshot from 2nd of November 2017 thanks to our hybrid fork. BTC holders that had at least 0.01 BTC at the moment of the snapshot (Bitcoin block 492820) can claim 0.5 BTX : 1.0 BTC via a private key sweep in the Bitcore core (bitcore-qt) wallet. The remaining 50% were used for the Monday airdrops which ended on April 30th 2018. How is your involvement with B3 coin, Bitsend and Bitcloud? Some of the basic source code for B3 was written by our developer Christian. However this was a side-job as an external programmer, there has never been an affiliation by the Bitcore team or by Chris with B3. Everything regarding B3 is now the full responsibility of the B3 team. Where can I learn more about Bitcore? What is a hybrid fork? Instead of forking Bitcoin at a specific block and copying the blockchain, Bitcore created a new coin with an empty blockchain. On the 2nd of November 2017 a snapshot of the Bitcoin blockchain was created and in the following days approximately ~ 5 000 000 transactions were created to fill all addresses (public keys) on the Bitcore blockchain, that had funds of 0.01 BTC or more on the Bitcoin chain. The funding ratio is 0.5 BTX : 1.0 BTC. Is there a lite wallet so I don’t have to download 135 GB+? There is no need for a lite wallet at the moment. You don’t have to download 135 GB+ because the entire blockchain is around ~ 1 GB at the moment so syncing a full wallet is quite fast. This is one of the benefits of not being a conventional Bitcoin fork. See hybrid fork for more information. No, Bitcore is not a fork in the conventional way like Bitcoin Cash, Bitcoin Gold or Bitcoin Diamond. Bitcore is a hybrid fork with a completely new blockchain. What wallet options are there? Where can I buy Bitcore BTX? You can buy Bitcore BTX on any of the exchanges we are currently listed on. Please go to the Eco System page and scroll down to the “Exchanges” part. There is a Telegram bot – How do I use it? Please backup your wallet.dat file and update to the latest Bitcore-core version: https://github.com/LIMXTEC/BitCore/releases and install. Now copy your wallet.dat to your new Bitcore folder. The software automatically updates all your addresses to new public keys starting with “2” instead of a “1”. You can now interact with all new addresses, however not with the old format. To do so, you need the old version of Bitcore Core (0.15.0.3 or lower). This is only relevant within the 3 months transition phase. After that period all services and users should be using the new software versions. What does the public key change mean? 5. It is important to note, that you can only use your old public keys to send to other old addresses and vis versa – you can send only to the new format from the new format. The address formats are not interchangeable. My wallet doesn’t sync, what can I do? Be patient. If you have a connection to the network, sometimes syncing can take a while, especially if it is your first time running Bitcore Core (Bitcore-QT). Also, make sure to check the LIMXTEC Github and try the latest version installer for Bitcore. 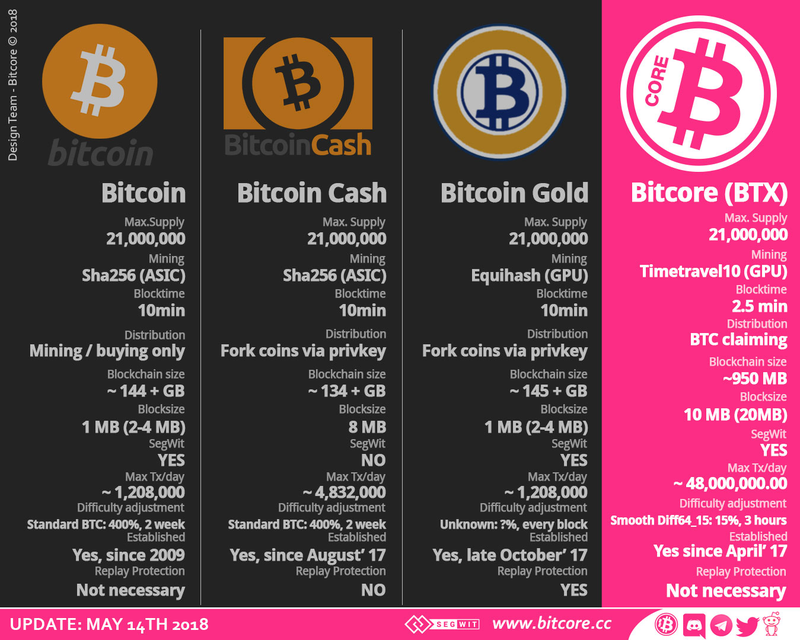 What is special about Bitcore compared to all the Bitcoin forks? I want to mine BTX – How? Bitcore (BTX) is a GPU mineable POW coin. It uses custom hash algorithm called “TimeTravel10”. Block reward is 3.125 BTX + transaction fees. Mining rewards follows the same halving pattern as BTC. How to mine Bitcore (BTX)? You will need to know if you have AMD or Nvidia graphic cards. For Nvidia cards you can use CCMINER or SPMOD. For AMD cards you will need SGMINER with a specific version which has “TimeTravel10” algorithm included. Where to mine Bitcore (BTX)? How to setup my rig for mining? You will need to create a custom .bat file which you will need to place inside the directory where sgminer.exe or ccminer.exe is located. This .bat file is your entry file to start mining as it will set your wallet address where you going to receive future payouts. You can also specify worker name, optional password, mining intensity, specify number of devices to use for mining etc. How to check profitability for mining? What is the hashrate of my graphic card? Coin control gives you the option to control from which address your coins are sent from and which change address the remainder of the coins are sent to. For detailed info please check out pdf guide or watch the German coin control video on our official youtube channel. There is also a German coin control pdf-guide.